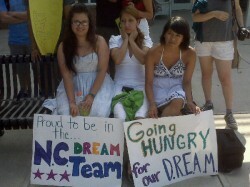 Inspired by students from New York who starved in front of Senator Schumer’s (D-NY) office for 10 whole days, three brave young undocumented women are also carrying out a hunger strike to compel Senator Kay Hagan (D-NC) to co-sponsor the DREAM Act, which would give them a pathway to citizenship. Loida, Rosario, and Viridiana are three young women who hail from different parts of the world, but they are united by virtue of the fact that all three are long-time, contributing residents of North Carolina who have paid out-of-state tuition to attend college in the state. Earlier this yea, after flip-flopping on its admissions policy five times over the decade, the North Carolina State Community College Board settled on admitting undocumented immigrants, as long as the students paid out-of-state tuition and had no access to financial aid. Supporting the federal DREAM Act for North Carolina only reaps rewards for the state because the few hundred students that are eligible would pay their way through college and contribute to state coffers. They would eventually graduate to join North Carolina’s workforce, paying both state and federal taxes. It should be a no-brainer for Hagan to support the legislation, but she remains noncommital and unsupportive, and hence, must be pushed to support the students. Hagan actually met with the students, but beyond vague references to supporting a stalled comprehensive immigration bill, the Senator from North Carolina was unwilling to go into details with the students, who continue to go hungry for the dreams. Senator Hagan has previously disclosed that while she supports comprehensive immigration reform, she does not support allowing undocumented immigrants into North Carolina colleges and universities. The Senator from North Carolina is not the only one with vague answers. With less than 30 working days of Congress, Democrats have their backs to the wall trying to approve a defense authorization bill with Don’t Ask Don’t Tell, confirm a Supreme Court justice, consider energy legislation, and deal with the Gulf Oil spill crisis. Deeply divided over whether to pass incremental reforms like the DREAM Act and AgJOBs or tackle the issue after midterm elections, Congress doesn’t seem to have the appetite to deal with immigration reform right now even as the students courageously starve for their dreams.